If you're at Palm Beach Atlantic University, you've probably seen the Living Waters Review. Every spring this creative writing magazine is released with short stories, poetry, art, and photography carefully curated by the editors. I got involved in Living Waters soon after I got my Canon Rebel because my roommate, Olivia, was one of the editors. She told me to submit some pictures just to see what would come of it. Looking back, I'm embarrassed, honestly I laugh at myself. I had no idea what Living Waters was looking for so I just naively sent them my favorite photos. Chickens, hayfields, some bulls from a ranch I visited, a flower or two...what a hot mess. They actually, to my great surprise, published one photo, a HUGE encouragement to me in those early days. 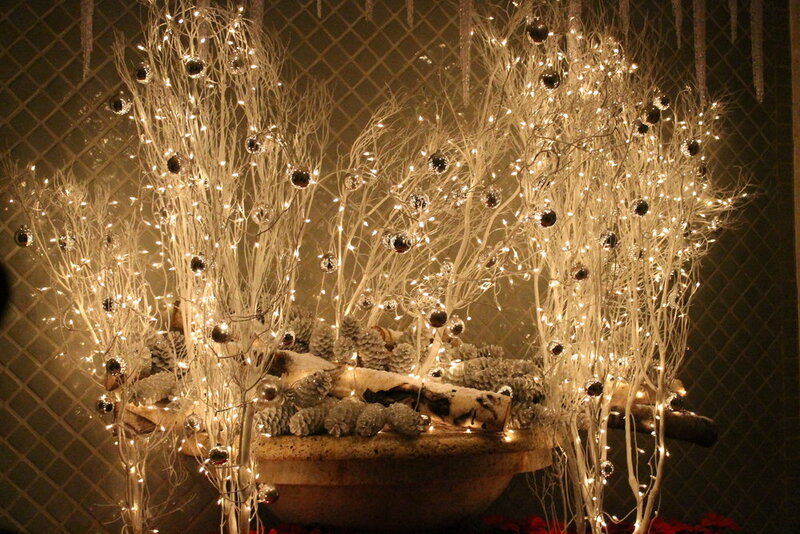 It was of a table setting I snapped haphazardly at a hotel where I was Christmas caroling. Who would've guessed! The next year, I refined my submissions and two of my photos were published! On a roll, right!? This time an owl with glowing feathers, one of my favorite photos of my favorite animal at the Busch Wildlife Sanctuary, and a macaw from the Palm Beach Zoo were featured, and I was really proud of those pictures. I worked hard to get them, and since they weren't portrait work, I was worried no one would ever see them. 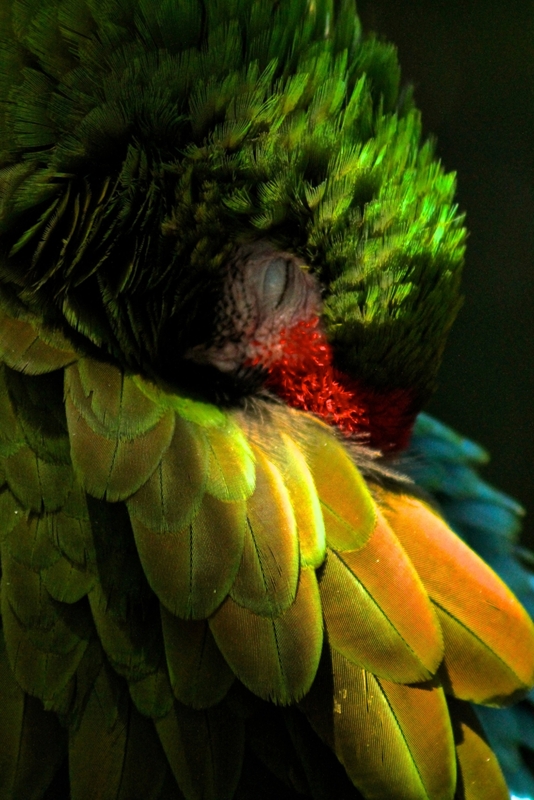 If you want to see more of my favorite birds, check out my post Birds of a Feather here. The next year rolled around and it was brought to my attention that it had been quite a long time since a photograph had been on the cover of Living Waters. I didn't really think that I'd get the cover, but as a creative, I wanted to at least try. So I started dreaming and brainstorming about what the concept "living waters" meant to me. I thought about the scripture that speaks of streams of living waters, and those that drink of it will never thirst again. I also thought about our quest for knowledge, especially at the university level, constantly devouring literature and endlessly churning out papers. Then, after a rough day of classes, I just decided to take my camera and escape. I am usually a planner, but I had no real plans, just some abstract musings. I grabbed an old book my friend found that was left in the rain, the pages all distorted and crinkled from being soaked and drying in the sun. I believe it was C.S. Lewis's "The Great Divorce." And I just walked with my camera and this little book. And I walked and I walked and I pondered the idea of magnificent life coming from water, the power of water paralleling the power of words. The still shots, first with the driftwood and the still water of the intracoastal, then under the Royal Palm Bridge, just didn't give me the right vibe. They were too still, too reflective. So I kept walking and walking until it was almost sunset and I thought the whole adventure was pointless. I kept going east, just to see the ocean, what color it was, and if there was anything interesting for me to put my soggy book on and snap a photo (my attitude had dwindled from optimistic to a bit grumpy). Let me just tell you this, I have never seen the ocean quite like it was on that day. My entire life spent 15 minutes from the beach and suddenly, for the first time, the magnificence and sheer power of the ocean rendered me speechless. I found a small outcropping of rocks and a slippery slab of concrete and started shooting. 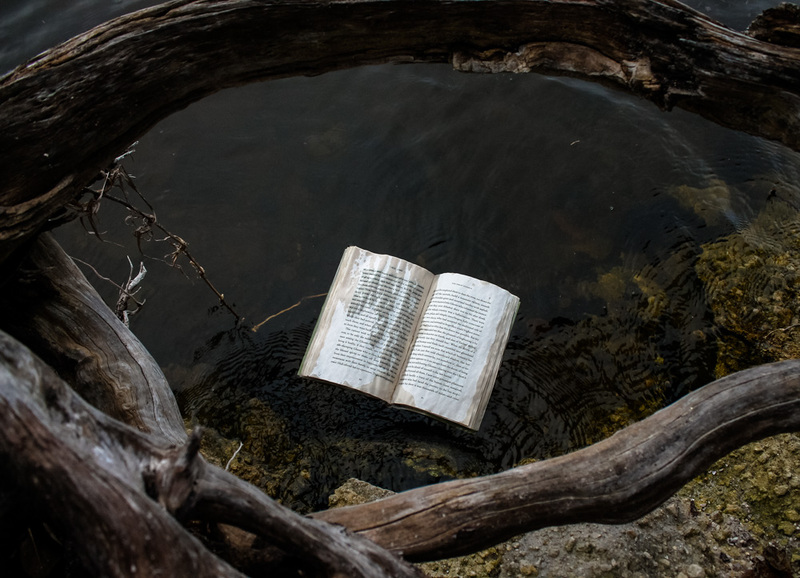 As strange as this may sound, my approach was to shoot the book like any human subject, like a mermaid on the rocks, the words and the water both coming alive. I didn't quite feel like I had the right shot, trying to find the right angle and timing of the crashing waves without getting my camera wet was much more difficult than I expected. The last 2 shots in the gallery basically sealed the deal for me, though. Firstly because I almost wiped out and ruined my camera when that final wave came rolling in. 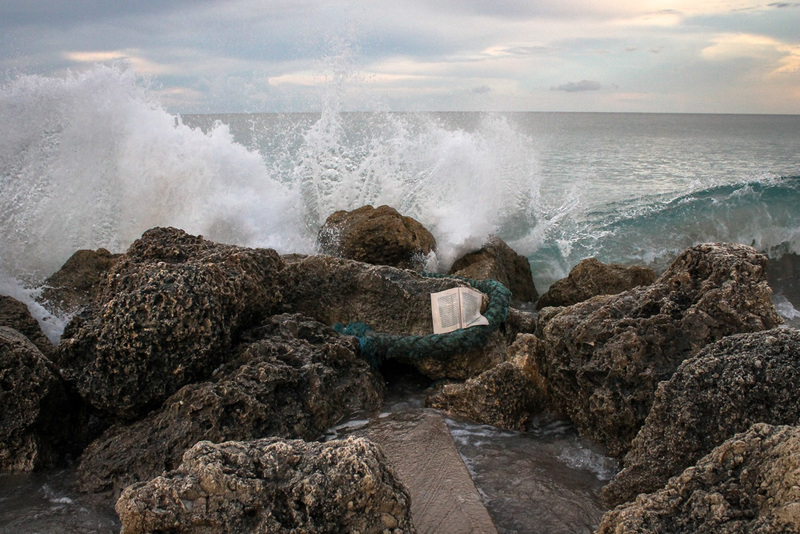 More importantly, it was that final wave that took the book out to sea and swallowed it whole, never to be seen again. Was this the best method to go about trying to shoot a cover of a literature review, probably not. But did it work? It absolutely did, and I'm incredibly thankful for the experience and adventure it provided.